It may appear monochromatic--and texture is its strong point--but the brash light of late morning does make the xeriscape contrasty: check out the weeping Artemisia filifolia on the upper-center right handside--like a hoary, miniature mammoth--and compare it to the next to last shot taken at twilight: the way plants morph in their appearance this time of year astonishes me! This is a closeup of Westridge--the very slope you saw in the previous two shots, taken in the morning with backlight on the fairy-ring muhly--the real subject of this blog: I have admired that amazing grass all my life--it forms dense pads on road cuts all over the Great Plains, and these gradually die out in the middle, producing wide fairy rings. 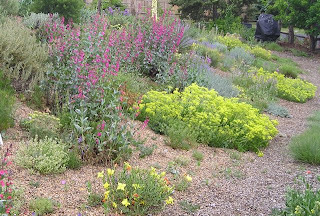 I never seemed to be there at the right time to collect seed, but Jeff Ottersberg--the greatest native plant nurseryman in Colorado--had many flats of Muhly leftover a few years ago--and gave me a few. These are quickly forming a diminutive groundcovering turf--and this time of year they explode into a cloud of lavender-silvery beauty.. Almost the same spot--a few feet further south perhaps, only taken at twiight.. the Muhly is taking on a purple cast--the various shrubs, yuccas, cacti and clouds of grasses really do deliver color in buckets, however subtle they may be! Another twilight shot--this time with a Cowpen daisy in front (Verbesina encelioides) and the mini-mammoth Artemisia in the background..altogether different in this light! I have already blogged about this grass last year elsewhere, and should wait a few days to post since it keeps getting more and more vivid--this is the southerly cousin of Ring Muhly--Muhlenbergia reverchonii in the lower meadow of the Rock Alpine Garden at Denver Botanic Gardens. This dazzling native grass was introduced to cultivation by Lauren and Scott Ogden from prairies near Dallas. This is undoubtedly even flashier than our local dwarf--that dark purple color does the trick--although I have seen rather dark fairy ring muhlies out there. They still trump the Texan because they are far more drought and heat tolerant! It may be later and later in September, but more and more treasures keep emergin in our gardens---many with vibrant colors and rare beauty. And, oh yes! Fall color is kicking in to boot! Who needs spring with all this gaudy stuff? Love the Verbesina encelioides. Do you know a seed source?? How many bushels do you need? I have many dozens of huge plants, all loaded with seed (which I try to harvest most of to keep there from being tens of thousands of plants next year!_ Send me your snail mail at panayotik@yahoo.com and you shall have lots of seed! Hi – Will you please post a link to your Blog at The Gardening Community at vorts.com? Our members will love it. Members include: Gardeners, Gardening Enthusiasts, Experts and Horticulturists. You can also add Photos, Videos, Articles and Classifieds if you like. Share something to get us through winter! Tried to log on the URL, but didn't work: feel free to post my blog--and perhaps help me figure out how to join up! We had a lot of the Verbesina encelioides that come up in the Congress Park Community Garden. Not sure if someone planted it or if it was in a seed mixture. Could it be considered borderline invasive?